Oops - we don't appear to have a video for the DR-7080C. With the same impressive scanning speed of 70ppm for both colour and black and white documents (A4/landscape/200dpi), the dynamic Canon DR-7080C document management scanner provides the perfect way to get through more work in far less time. Duplex scanning in colour is equally rapid, at 36ipm (images per minute). 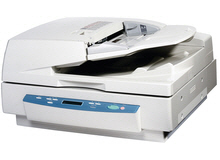 Despite its high speed, the DR-7080C produces unsurpassed quality scanning, giving you the very best of both worlds. By adapting a 3-line CCD sensor, it provides continuous tone quality scanning. 24-bit colour and 256 leves of greyscale make this model highly suitable for scanning all types of documents. The image output resolution ranges from 100 dpi up to 600 dpi. An inclined-plane separating mechanism is built into the scanner. This means that when the ADF (Automatic Document Feeder) is used there is smooth and rapid document feeding - with a pad separation mechanism virtually eliminating any risk of double sheet feeding. Furthermore, with flatbed functionality, books, bound documents and fragile or damaged paper can be scanned with ease. A clear and intuitive control panel ensures exceptional ease of use for all operations. Routine job processes - such as scan to PC, scan to mail, scan to print and scan/run application - can be pre-registered and carried out direcly from the control panel. The DR-7080C is equally easy to install, thanks to its "plug and scan" simplicity.